Westfield partnered with the Akron-Canton Regional Foodbank last week to sponsor a volunteer project for employees on its campus. 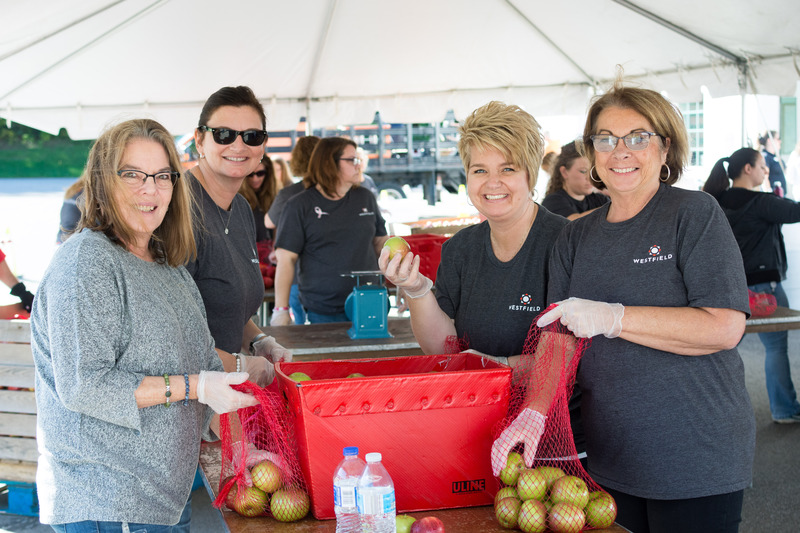 This is the second year nearly 150 employees volunteered for the project, helping sort and bag 15,600 pounds of Ohio-grown apples. For some employees, because of their role within the organization, it’s difficult to leave the office. They haven’t had the opportunity to engage in volunteer work at the Foodbank, so the Foodbank brought the work to them. A semitrailer filled with apples, sorting bins and scales were set up in a Westfield parking lot. Volunteers from various departments worked one-hour shifts to help sort apples into 5-pound bags. This volunteer project is a unique opportunity, not only for Westfield employees, but also the Foodbank. The Foodbank doesn’t typically take projects on the road, however, Westfield sponsored the project by purchasing the apples. If you’re looking for unique ways to connect with your Foodbank, please contact us at 330.535.6900.